How can you design the perfect fire pit for your winter? Winter is on its way and that means that chilly weather will soon put an end to hanging out in the back yard with your friends. Well, that is, unless you have a fire pit. A fire pit is the perfect solution for a frigid evening in November to keep you and your guests toasty while you share in each other’s company. Today we’re going to talk about how you can plan out the best fire pit to fit your needs. Create a clear budget for your ffire pit. Whenever you start any kind of home improvement project, you need to make sure that you have a clear budget that is both detailed and firm. Start with how much you are willing to spend in total and then divide up that sum into the different parts of your fire pit. Make sure to keep seating and other features in mind when planning, and always plan for a little cushion if something goes awry. Make sure that you know the law of the land. Different cities and residential areas have different rules and regulations for their fire pits. You can check with your local home owner’s association if you have detailed questions on this topic. It’s time to design your perfect fire pit. This is the fun part. 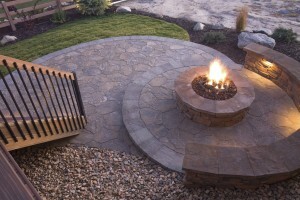 You get to pick out the type of stone, shape, and what kind of fuel your new fire pit will use. You may choose from materials such as stone, brick, block, stainless steel, or other material types. As far as fuel goes, wood is often the most popular choice due to its rustic scent, but some people prefer propane or natural gas. Of course, we would be more than happy to consult with you on these choices and answer any questions you may have! This entry was posted on Thursday, November 10th, 2016 at 5:43 pm. Both comments and pings are currently closed.